We are Out-Of-Network with most PPO Insurance Providers. Out-Of-Network means that we are not in a contract with your health insurance provider. When a contract is established with an insurance company they agree to reimburse for our sessions at a pre-determined rate. At the time of your visit you are only responsible for your Co-Pay, Co-Insurance and/or the total amount if you have not reached your Deductible. All PPO Health Insurance Plans that are not Blue Cross Blue Shield (i.e. Cigna, United Health Care, Sharp, etc.) 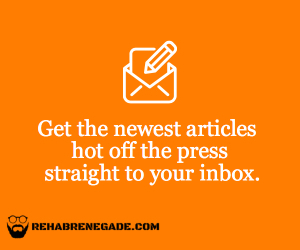 are considered Out-Of-Network Providers for Rehab Renegade. If your Insurance is Out-Of-Network, you are responsible for the cost of the session. For out-of-network visits, we can provide you with a “Super Bill” that you can submit to your insurance company for reimbursement. Please note that reimbursement amounts will vary by insurance company and your specific policy, and that your insurance company may not reimburse you the full cost of the session. It is always a good idea to get prior insurance approval if you are interested in a Super Bill. You also have the option to pay an affordable cash rate if you do not wish to receive reimbursement. Why Are You Out-Of-Network With Some Insurances? Most health insurance reimbursement is too low to allow us to provide the quality of care that we think is a must. We believe the most important thing we can offer is a relationship with our clients. In an effort to provide regular communication, consistent availability and longer duration appointments we have to be selective with which insurances we network with. We also believe that our style of treatment is more comprehensive. Saving you time and money in the long run. While most PT and Chiropractic clinics see you 2-3x a week for 30 minutes or less (or while juggling other patients), we usually see you 1-2x a week for up to 60 minutes, one on one. The time and quality we provide means you need less visits, and in the long run end up spending less with us than a traditional PT or Chiropractic offices. DO I NEED A REFERRAL FROM MY PHYSICIAN FOR PHYSICAL THERAPY? In most cases NO. This is because California is a direct access state. This means you can be seen without a physician’s referral for up to 45 calendar days or 12 visits. If you want to know what it costs & what availability we have click the button below to fill out a short form.